Girls who also like to eat and drink bloodies. That’s basically our criteria for lady friends. Our trip to The Bristol a little while back was result of “Brunch Bunch,” a bi-monthly standing brunch date with pals who are former coworkers. If you recall, the two ladies of this blog were coworkers, not once, but twice. While we often sort through crazy remixes and over-the-top skewers of meats, cheese and pickled anything, it’s often nice to encounter a bloody mary that doesn’t have to try too hard. 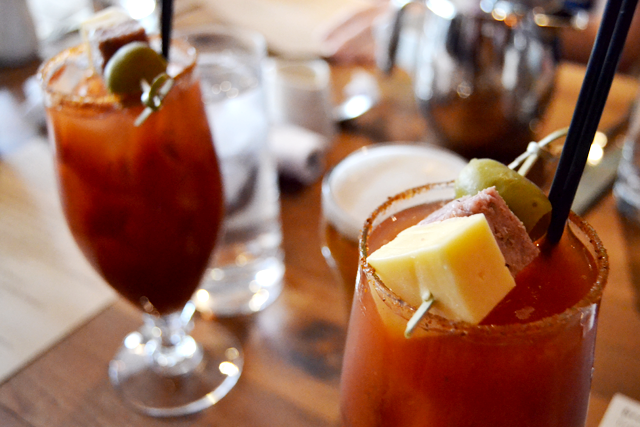 You can taste the handcrafted care that goes into the Bristol Bloody Mary. It’s spicy, thick and tomatoe-y (yeah, we made that a word), and finishes with a citrus tanginess. And for a spot that’s known for meats, the garnish is a simply good skewer of cheese, salami and olive. It’s the kind of bloody that’s not a showstopper but never underwhelms. 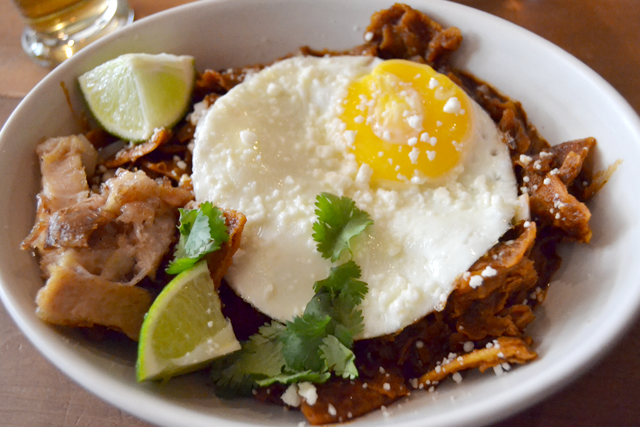 Get ready for a shocker: we ordered chilaquiles. Speaking of stealing the show, take notice of the tender, savory braised pork. Simple flavors work well together here with the fried egg, lime and cilantro. And a not a hot mess of soggy tortilla chips. 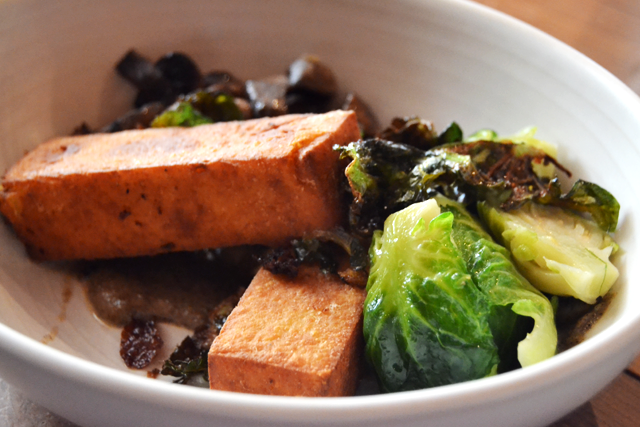 The other lady of this duo had the slightly healthier polenta with mushrooms and brussels sprouts. It was tasty, but in all honesty, there was so many regrets for not ordering the chilaquiles. 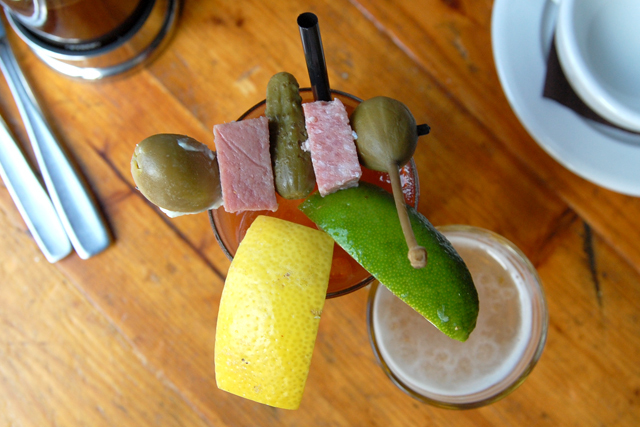 Moral of the story: thumbs up for this solid Bucktown bloody mary. Until next time, friends. Call us crazy. It’s not like it’d be the first time. Who goes to Mindy’s Hot Chocolate in Bucktown and NOT order a hot chocolate? It’s like going to In ‘N Out without ordering a burger. Or buying a dress from the Levi’s Store. Well, we didn’t. We’re more savory than sweet anyway. Close second: watching a Chicago food tour group slurp down theirs. Less calories. We did order a frenzy of other good food and drinks. 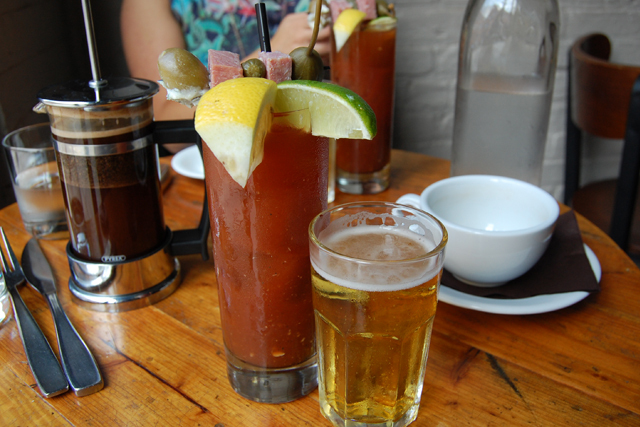 And of course, our favorite brunch beverage. Duh, bloody mary. The menu wasn’t super revelatory about what’s in the house bloody. Only that it’s “Andy’s handcrafted bloody mary mix.” We imagine the staples are included: horseradish, Worcestershire sauce and hot sauce. It was slightly watery, but still quite above average. You can taste the handcrafted part—the ingredients and garnishes were discerningly fresh. And speaking of garnishes, the blue-cheese stuffed olive was money. Cash money. Now the food. 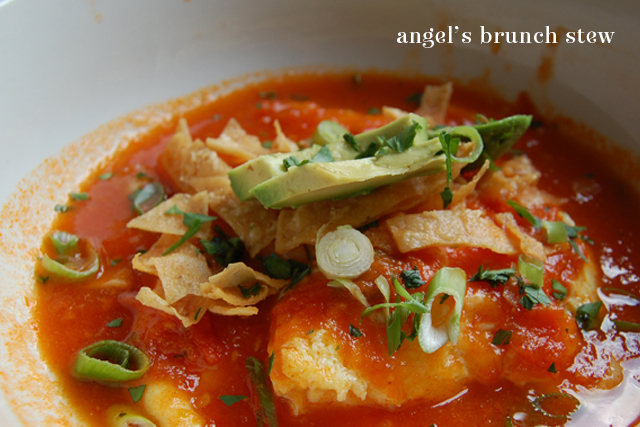 Because we adore brunch fare with a Mexican flair, we had to try Angel’s Brunch Stew. It was like a lighter version of chilaquiles with a tomato broth, lightly scrambled farm egg and chiles, topped with avocados and crunchy tortilla strips. Slightly spicy and totally savory. It was filling without feeling heavy. 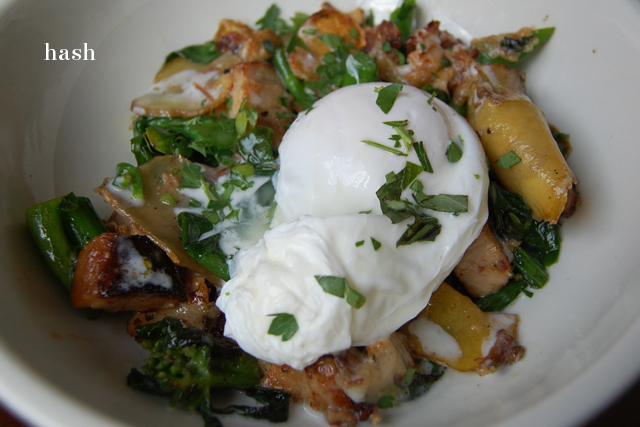 The hash was made with pork belly, locally sourced broccoli, creme fraiche, gruyere and a perfectly poached egg. You’d think this be superbly rich or heavy, but the lightness of poached egg and veggies create nicely balanced flavors and textures. We already got it out the way that we didn’t order hot chocolate. HOWEVER, we did order dessert in the form of cookies and more brunch cocktails. Cookies, which didn’t even last long enough to be photographed. Notice the crumbs? Let’s just say they were delicious and leave it at that. 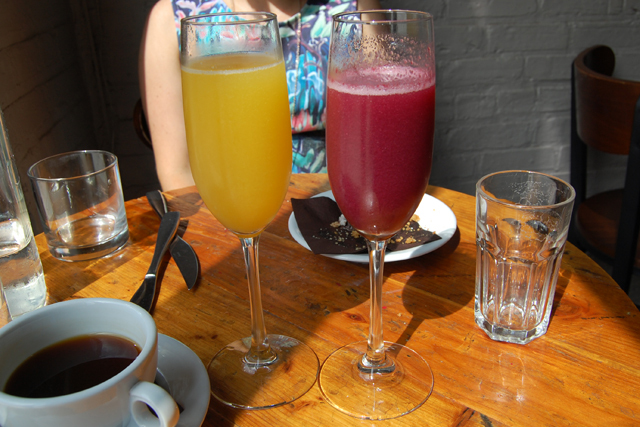 The bellini of the day was Concord Grape, which tasted like an adult version of Welch’s grape juice. No one here is complaining. We always coordinate our drinks to match our tops. Like that? Anyway, get thee to Hot Chocolate for a stand-up bloody mary and delightfully balanced, locally sourced brunch. Learn from our mistakes and get a damn hot chocolate, will you?